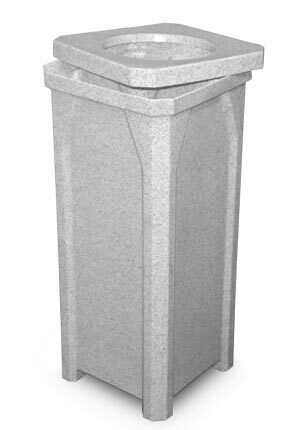 This square trash receptacle with 10" diameter lid is perfect for hallways, restrooms or schools. Made from recycled plastic polyethylene, it is manufactured to withstand the harshest environments. With molded-in handles, this lightweight trash receptacle couldn't be easier to move. The recycled plastic will not fade, dent or crack making them ideal for use outside as well as inside. Polyethylene trash receptacle can hold up to 20 gallons. Recycled plastic 10" diameter lid and liner included. Available in either the solid or granite color options shown below.